Bundesverband Flachglas e.V. today has around 110 members with more than 220 facilities inside and outside Germany. It also has more than 50 supporting members, most of whom are suppliers or service providers for the regular members. Manufacture of the basic product, float glass or cast glass, is on an industrial scale. All companies represented in Germany who produce glass in their glassworks – highly modernized production facilities – are BF members, so that BF acts as the mouthpiece for the entire industry. The next step – covering glass with, for example, thermal insulation or solar control coatings – is in some cases done by the glass manufacturers themselves, but some small and medium-sized companies too have the appropriate technologies. 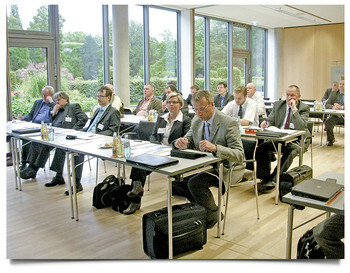 All glass coating companies located in Germany are also BF members. Production of the insulating glass itself is the domain of a large number of small and medium-sized insulating glass manufacturers and finishers. The degree of organization within BF at this level is 80 %. The clients of BF’s members are companies in the glass-processing trade, such as glazers and window manufacturers. They receive not only the commodity of “flat glass” in its various designs, but also many services: from glass processing – cutting to size, grinding and finishing – to the supply of brochures and other sales-promoting material, project consulting, planning and training.